Working with your local zoning board or municipal officials will be an important step in converting an existing billboard or establishing a new site. Digital billboards offer numerous benefits to communities, including increasing the tax base as local operators and their clients boost profits. A recent study by the Outdoor Advertising of America (OAAA) showed that much of the money spent on digital billboard campaigns really does stay local. More than 70 percent of billboard advertisers are local businesses. In smaller markets, 90 percent of billboard advertisements are for local businesses, and more than 96 percent of those advertisers are small businesses. Digital billboards also help community agencies and governments communicate with the public. From emergency weather alerts to FBI wanted postings and Amber alerts, digital billboards offer a way to communicate quickly and effectively in an unprecedented way. While some communities have expressed safety concerns over digital billboards, a recent landmark report by the U.S. Department of Transportation Federal Highway Administration confirms that digital billboards pose no safety risk to passing motorists. The study tracked eye-movements of motorists as they passed by both static and digital billboards to measure how long their attention was diverted from the road ahead. The study concluded that the glances toward the digital billboards fell far below the two-second benchmark, which would constitute a hazard, according to the National Highway Traffic Safety Administration. This study is just the most recent in a long line of traffic safety studies conducted on digital billboards with similar results. 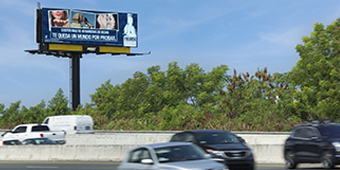 During 2009 and 2010, five studies were conducted to analyze more than 160,000 accident records in proximity to 69 digital billboard structures. The billboard sizes varied, and the locations included Interstates, expressways and local roads. The combined traffic counts in these studies exceed one-half billion cars per year. In all five of the studies, there was no statistically-significant relationship between accidents and digital billboards. These studies also showed that the age of the driver and the time of the day were not factors. In 2007, state officials from South Carolina, Virginia and West Virginia also found that the rate of accidents did not increase in proximity to digital billboards. Local officials in El Paso, Texas; Rochester, Minn.; Cleveland, Ohio; and elsewhere have echoed this same finding. Next Topic: Which locations are the best for a digital billboard?